So you’ve sold one of your books – woohoo! Now what? Use the checkout process as an opportunity to promote future sales. Aside from business cards or coupons, there are things you can give out that can help improve your chances of earning a repeat customer. What kinds of things could you give out? Rather than look at the wide range of available promotional products, I'm going to focus on items that have a direct connection to handmade books. When I sell a photo album, I give the customer a free pack of photo corners. My husband came up with this idea when he heard several customers ask me where they could buy them. He told me that I should just include them with the purchase – that way they can use their photo album as soon as they got home. I buy my photo corners at wholesale from Orange Art. If someone buys a journal - how about giving them a pen? You can buy pens that have your business name, website, and/or logo on them. I’ve been thinking about getting some nice pens to give out when people buy my most expensive journals. With personalization and shipping, they come to about $4.00 each – I’m willing to spend that on someone who buys an $85.00 journal. I also give out cards with care instructions, which includes information such as how to store a book or what to do if a botanical inclusion comes loose. I usually get a positive reaction from customers when I tell them that I’m putting a care card in their bag - you make a good impression on your customer by showing that you care about their purchase. Bookmarks are a good match for journals. You can make them inexpensively by using scraps of paper from other projects. Another option would be to have bookmarks professionally printed with photos of your work on them. 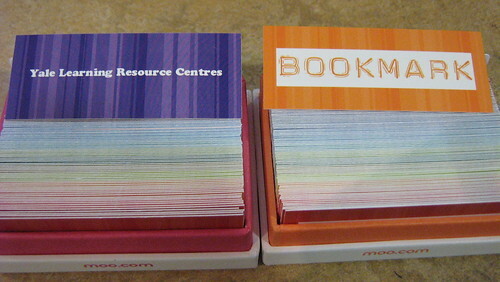 Moo MiniCards could work as bookmarks for smaller books. It’s really easy to get them made because Moo integrates with Etsy and can pull photos right out of your shop. Lastly, you can give out small handmade books with a purchase. If you’re like me, you have lots of strips of paper that came from larger sheets and are too big to toss. You can easily make a single signature book as a giveaway. You can even use business cards as covers. Whenever possible, try to have your contact information on your giveaway item. That way, every time they see or use the item, they will be reminded of you and your work. Do you give things to customers when they make a purchase? What do you do? I'd love to hear about it! And if you have images of your giveaways, let us see them! Send me an Email with photos and I'll try to include them in a follow-up post next week. Be sure to include your name and a link to your Etsy shop. Another oh-so-helpful post! Thank you (again) for the great ideas and helpful advice. I have only done one face-to-face sale so far and wasn't offering any extras to my customers. However, I will come back to this post when I'm planning for my next craft fair etc. Meanwhile, when I send out items in the post, I always pop a note into the parcel, just to say thanks for the order. I have put packs of photo corners in with photo albums, but just now I've run out (! - time to go shopping!). It's definitely something I should think about a bit more... thank you for the nudge in the right direction!